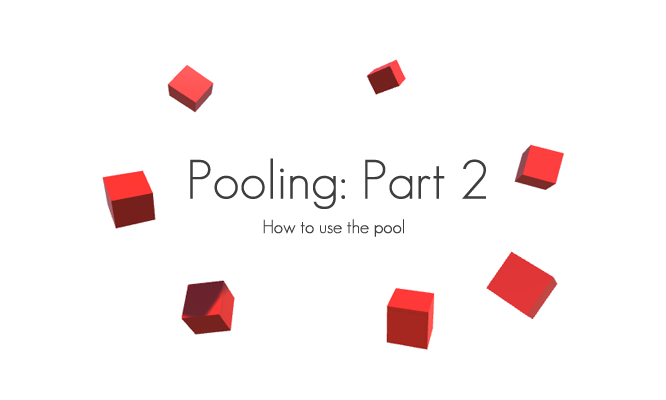 In the first part of the pooling series I explained why you should use pooling and did a simple implementation of a pool class using a stack. In this post I’m going to show you an example how to use the prior work in your project. For this we create a scene with an endless amount of flying cubes that are spawned at the right border of the screen and will fly to the opposite side. Given you’ve got the code from the previous part of the pooling tutorial, we only need a prefab and an additional script for this one to work. For the prefab you can go with whatever you want. I went with the red cubes you see above. The script is called Spawner.cs and implements two methods: Spawn() and Update(). To create a new cube at the right side of the screen the Spawn() method is called every x seconds. The Update() method updates the position and rotation of all flying cubes. * Spawn a new cube at the spawner position adding some randomness to it. // Move all objects. If an object x-position has reached -20 it is pushed back into the pool. You can download the whole Unity project here.